Spandex is a lightweight, synthetic fiber that is used to make stretchable clothing such as sportswear. It is made up of a long chain polymer called polyurethane, which is produced by reacting a polyester with a diisocyanate. The polymer is converted into a fiber using a dry spinning technique. First produced in the early 1950s, spandex was initially developed as a replacement for rubber. Although the market for spandex remains relatively small compared to other fibers such as cotton or nylon, new applications for spandex are continually being discovered. Spandex is a synthetic polymer. Chemically, it is made up of a long-chain polyglycol combined with a short diisocyanate, and contains at least 85% polyurethane. It is an elastomer, which means it can be stretched to a certain degree and it recoils when released. These fibers are superior to rubber because they are stronger, lighter, and more versatile. In fact, spandex fibers can be stretched to almost 500% of their length. This unique elastic property of the spandex fibers is a direct result of the material's chemical composition. The fibers are made up of numerous polymer strands. These strands are composed of two types of segments: long, amorphous segments and short, rigid segments. In their natural state, the amorphous segments have a random molecular structure. They intermingle and make the fibers soft. Some of the rigid portions of the polymers bond with each other and give the fiber structure. When a force is applied to stretch the fibers, the bonds between the rigid sections are broken, and the amorphous segments straighten out. This makes the amorphous segments longer, thereby increasing the length of the fiber. When the fiber is stretched to its maximum length, the rigid segments again bond with each other. The amorphous segments remain in an elongated state. This makes the fiber stiffer and stronger. After the force is removed, the amorphous segments recoil and the fiber returns to its relaxed state. By using the elastic properties of spandex fibers, scientists can create fabrics that have desirable stretching and strength characteristics. The primary use for spandex fibers is in fabric. They are useful for a number of reasons. First, they can be stretched repeatedly, and will return almost exactly back to original size and shape. Second, they are lightweight, soft, and smooth. Additionally, they are easily dyed. They are also resilient since they are resistant to abrasion and the deleterious effects of body oils, perspiration, and detergents. They are compatible with other materials, and can be spun with other types of fibers to produce unique fabrics, which have characteristics of both fibers. Spandex is used in a variety of different clothing types. Since it is lightweight and does not restrict movement, it is most often used in athletic wear. This includes such garments as swimsuits, bicycle pants, and exercise wear. The form-fitting properties of spandex makes it a good for use in under-garments. Hence, it is used in waist bands, support hose, bras, and briefs. The development of spandex was started during World War II. At this time, chemists took on the challenge of developing synthetic replacements for rubber. Two primary motivating factors prompted their research. First, the war effort required most of the available rubber for building equipment. Second, the price of rubber was unstable and it fluctuated frequently. Developing an alternative to rubber could solve both of these problems. At first, their goal was to develop a durable elastic strand based on synthetic polymers. In 1940, the first polyurethane elastomers were produced. These polymers produced millable gums, which were an adequate alternative to rubber. Around the same time, scientists at Du Pont produced the first nylon polymers. These early nylon polymers were stiff and rigid, so efforts were begun to make them more elastic. When scientists found that other polyurethanes could be made into fine threads, they decided that these materials might be useful in making more stretchable nylons or in making lightweight garments. The first spandex fibers were produced on an experimental level by one of the early pioneers in polymer chemistry, Farbenfabriken Bayer. He earned a German patent for his synthesis in 1952. The final development of the fibers were worked out independently by scientists at Du Pont and the U.S. Rubber Company. Du Pont used the brand name Lycra and began full scale manufacture in 1962. They are currently the world leader in the production of spandex fibers. A variety of raw materials are used to produce stretchable spandex fibers. This includes prepolymers which produce the backbone of the fiber, stabilizers which protect the integrity of the polymer, and colorants. Two types of prepolymers are reacted to produce the spandex fiber polymer back-bone. One is a flexible macroglycol while the other is a stiff diisocyanate. The macro-glycol can be a polyester, polyether, polycarbonate, polycaprolactone or some combination of these. These are long chain polymers, which have hydroxyl groups (-OH) on both ends. The important feature of these molecules is that they are long and flexible. This part of the spandex fiber is responsible for its stretching characteristic. The other prepolymer used to produce spandex is a polymeric diisocyanate. This is a shorter chain polymer, which has an isocyanate (-NCO) group on both ends. The principal characteristic of this molecule is its rigidity. In the fiber, this molecule provides strength. Corset designed by Jacob Kindliman of New York City in 1890. 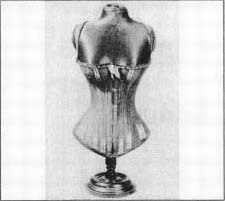 This corset-clad torso was produced by Jacob Kindliman of New York City in 1890. Kindliman, a corsetiere, hardly needed to advertise. At that time, women thought it was necessary to wear a corset and considered themselves indecently dressed without it until early in the twentieth century. Corsets were a combination brassiere-girdle-waist cincher in an all-in-one garment, forming the foundation shape for fashionable dress. In days before spandex, how did the corset contour the body effectively? In the eighteenth century, thick quilting and stout seams on the corset shaped the body when the garment was tightly laced. In the early nineteenth century, baleen, a bony but bendable substance from the mouth of the baleen whale, was sewn into seams of the corset (hence the term whalebone corsets), however the late 1800s corsets like this were stiffened with small, thin strips of steel covered with fabric. Such steel-clad corsets did not permit movement or comfort. By World War I, American women began separating parts of the corset into two garments—the girdle (waist and hip shaper) and bandeau (softer band used to support and shape the breasts). groups (-OH) on the macroglycols react with the isocyanates. Each molecule gets added on to the end of another molecule, and a long chain polymer is formed. This is known as a step-growth or addition polymerization. To initiate this reaction, a catalyst such as diazobicyclo[2.2.2]octane must be used. Other low molecular weight amines are added to control the molecular weight of the fibers. Spandex fibers are vulnerable to damage from a variety of sources including heat, light atmospheric contaminants, and chlorine. For this reason, stabilizers are added to protect the fibers. Antioxidants are one type of stabilizer. additives must also be added. All of the stabilizers that are added to the spandex fibers are designed to be resistant to solvent exposure since this could have a damaging effect on the fiber. When they are first produced, spandex fibers are white. Therefore, colorants are added to improve their aesthetic appearance. Dispersed and acid dyes are typically used. If the spandex fibers are interwoven with other fibers such as nylon or polyester, special dying methods are required. Spandex fibers are produced in four different ways including melt extrusion, reaction spinning, solution dry spinning, and solution wet spinning. Each of these methods involve the initial step of reacting monomers to produce a prepolymer. Then the prepolymer is reacted further, in various ways, and drawn out to produce a long fiber. Since solution dry spinning is used to produce over 90% of the world's spandex fibers, it is described. 1 The first step in the production of spandex is the production of the prepolymer. This is done by mixing a macroglycol with a diisocyanate monomer. The compounds are mixed in a reaction vessel and under the right conditions they react to form a prepolymer. Since the ratio of the component materials produces fibers with varying characteristics, it is strictly controlled. A typical ratio of glycol to diisocyanate may be 1:2. 2 In dry spinning fiber production, the prepolymer is further reacted with an equal amount of diamine. This is known as a chain extension reaction. The resulting solution is diluted with a solvent to produce the spinning solution. The solvent helps make the solution thinner and more easily handled. It can then be pumped into the fiber production cell. 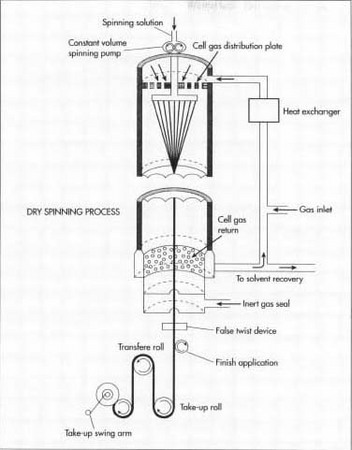 3 The spinning solution is pumped into a cylindrical spinning cell where it is cured and converted into fibers. In this cell, the polymer solution is forced through a metal plate, called a spinneret, which has small holes throughout. This causes the solution to be aligned in strands of liquid polymer. As the strands pass through the cell, they are heated in the presence of a nitrogen and solvent gas. These conditions cause the liquid polymer to chemically react and form solid strands. 4 As the fibers exit the cell, a specific amount of the solid strands are bundled together to produce the desired thickness. This is done with a compressed air device that twists the fibers together. In reality, each fiber of spandex is made up of many smaller individual fibers that adhere to one another due to the natural stickiness of their surface. 5 The fibers are then treated with a finishing agent. This may be magnesium stearate or another polymer such as poly(dimethyl-siloxane). These finishing materials prevent the fibers from sticking together and aid in textile manufacture. After this treatment, the fibers are transferred through a series of rollers onto a spool. The windup speed of the entire process can be anywhere from 300-500 mi (482.7-804.5 km) per minute depending on the thickness of the fibers. 6 When the spools are filled with fiber, they are put into final packaging and shipped to textile manufacturers and other customers. Here, the fibers may be woven with other fibers such as cotton or nylon to produce the fabric that is used in clothing manufacture. This fabric can also be dyed to produce a desired color. To ensure the quality of the spandex fibers, manufacturers monitor the product during each phase of production. Inspections begin with the evaluation of the incoming raw materials. Various chemical and physical characteristics are tested. For example, the pH, specific gravity, and viscosity of the diisocyanate may be checked. Additionally, appearance, color, and odor can also be evaluated. Only by having strict quality control checks on the starting materials can the manufacturer be sure that they will produce a consistent end product. After production, the spandex fibers are also tested. These tests may include those that evaluate fiber elasticity, resilience and absorbency. The quality of spandex fibers has continually improved since they were first developed. Various areas of research will help continue their improvement. For example, scientists have found that by changing the starting prepolymers they can develop fibers which have even better stretching characteristics. Other characteristics can be improved by using different prepolymer ratios, better catalysts, and various fillers. In addition to spandex fiber improvements, it is likely that advanced fabrics will be produced which incorporate spandex fibers with conventional fibers. Currently, nylon/spandex fiber blends are available. Finally, improvements in manufacturing will also be discovered. These will focus on producing fibers faster and more efficiently. Jerde, Judith. Encyclopedia of Textiles. Facts on File, 1992. Lewin, M. and J. Preston, ed. High Technology Fibers. New York: Marcel Dekker, 1985. Devra, A. U.S. Patent 5,303, 882, 1994. Goodrich, C & W. Evans. U.S. Patent 5,028,642, 1991. Thank you for this highly enlightening piece. I am not a chemist and as such find some of the polymers mentioned here a little hard to comprehend. I just want to know if spandex contains silk as one of its constituents. Thank you.